East West Players (EWP), in association with the Los Angeles LGBT Center, announces the cast and creative team for the world premiere of Nathan Ramos’ “As We Babble On,” which was the winner of East West Players’ 2042: See Change Playwriting Competition. 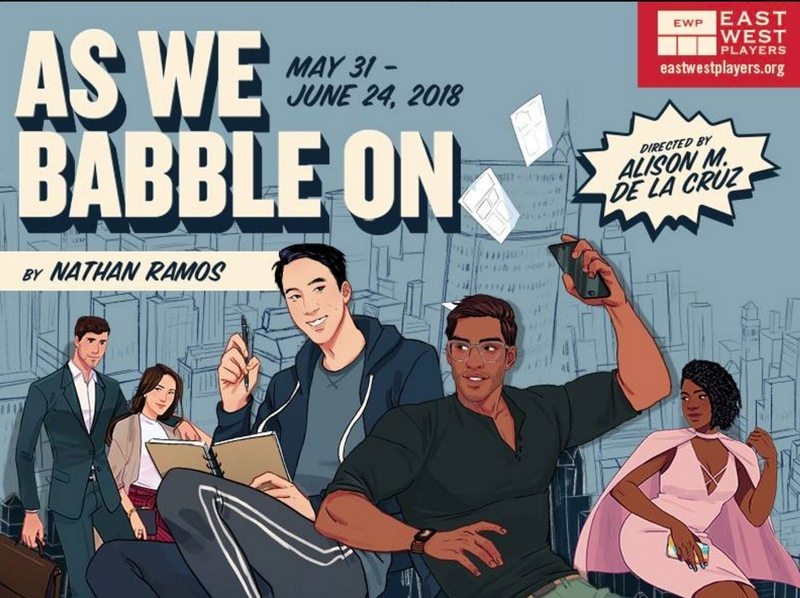 Directed by Alison M. De La Cruz, director of performing arts and community engagement at the Japanese American Cultural & Community Center, “As We Babble On” begins performances on May 31 and runs until June 24, with opening night on June 6. The play looks at the pursuit of success, its costs, and conquering the Swedish BIGBOX. Benji, a first-generation Asian American, struggles in New York City to find his voice as his writing career stalls. As the professional paths of his best friend Sheila and his half-sister Laura begin to blossom, he begins to unravel. “As We Babble On” explores what lengths we are willing to go to realize our dreams, whether morality is tied to upward mobility, and whether boxed wine and soda is an appropriate sangria recipe after the age of 24. Making their EWP debuts are Will Choi (Asian AF and Scarlett Johansson Presents) as Benji, Sachin Bhatt (Asian European tour of “West Side Story” and Broadway first national tour of “Bombay Dreams”) as Vish, Jiavani Linayo (member of Baby Wants Candy) as Sheila, Jaime Schwartz (“Love Alone” at Shaker Bridge Theatre) as Laura, and Bobby Foley (Odysseus in “These Seven Sicknesses” and Art Faerie in “Girls”) as Orson. The creative team includes Meredith Patt (dramaturg), Tesshi Nakagawa (scenic designer), Jason Bieber (lighting designer), Eddy Vajarakitpongse (projection designer), Rani De Leon (sound designer), Danielle Domingue Sumi (costume designer), Glenn Michael Baker (prop master), and Brandon Hong Cheng (stage manager). All performances will be staged at the David Henry Hwang Theater at the Union Center of the Arts at 120 Judge John Aiso St. (between Temple and First) in Little Tokyo. Previews are Friday, May 31, through Sunday, June 3, with 8 p.m. shows from Friday to Saturday, and a 2 p.m. matinee on Sunday. All preview seats are $25. Regular performances are from Thursday, June 7, through Sunday, June 24, with 8 p.m. shows from Thursday to Saturday, and 2 p.m. matinees on Saturday and Sunday. Opening night is Wednesday, June 6, at 8 p.m.
Tickets may be purchased online at www.eastwestplayers.org or by calling (213) 625-7000, making sure to mention any wheelchair/accessible seating needs. Student, senior, and group discounts are available. General admission ticket prices range from $40 to $50. Dates, details, and ticket prices are subject to change. “As We Babble On” is part of The Company We Keep: A 52nd Anniversary Season, which focuses on community and partnerships. The S. Mark Taper Foundation Endowment supports the continued artistic quality of EWP’s mainstage productions. EWP, the nation’s longest-running professional theater of color and the largest producing organization of Asian American artistic work, was founded in 1965, at a time when Asian Pacific Islanders (APIs) faced limited or no opportunities to see their experiences reflected outside of stereotypical and demeaning caricatures in the American landscape. EWP not only ensures that API stories are told, but also works to increase access, inclusion, and representation in the economy.